On Saturday there was still plenty of snow on the ground, but the main roads looked clear, so in the afternoon we headed to Cambridge. I didn’t think the race would be cancelled- the cynical part of me thought that a big company like that wouldn’t want to deal with the fallout, but also the race takes places on closed roads, and the traffic does a good job of clearing snow away. 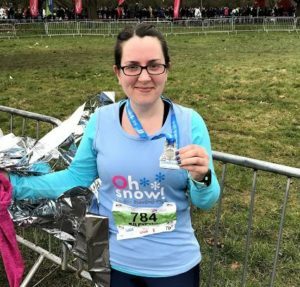 The Welwyn half marathon was due to happen on the same day, but they postponed it (until September) on Friday as it is run on pavements and paths so they couldn’t clear it all. After leaving our bags in the hotel, we walked into the centre, to the race HQ, and around some of the parks. 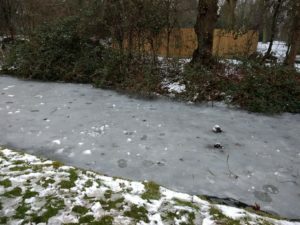 There were loads of very sad looking ducks wandering about on the grass and it turned out that the rivers were frozen solid- poor ducks! We went out for dinner (pizza) and then to the cinema, to see Ladybird (which I really enjoyed). The cinema were trialling new recliner style seats, so there were only 8 seats per row. The seats had buttons to recline them and lift the footrest up, and even a huge tray to move around (a bit like when you are on the exit row of a plane) and rest all your snacks on. We’d smuggled in a few m n m’s, but the people next to us took up the entire tray with very noisy food like hot dogs, nachos, and something in a foil wrapper. When we got back it was time to get my race kit out. 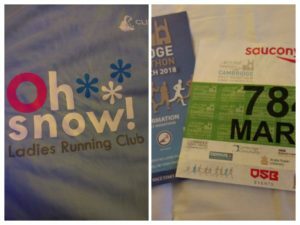 I found my OH Snow top, which was made for the London Winter run- I thought it was appropriate! I opted for a long sleeved top, the vest (and number) over the top, a long sleeved zip up to tie around my waist, and a headband to keep my ears warm. I wore my rain jacket to the start and Andy took it off with him (we had read that last year the bag drop queues were horrendous and I didn’t want to be waiting for 45 mins after finishing). I had a bit of malt loaf and a nuun tab in some water for breakfast. We’d timed the walk from the start to the hotel, so we left at 9am and had plenty of time in the race village to find the start pen (there were big inflatable arches corresponding to the colour of your bib). I was fairly warm on the walk there, but I got quite cold stood around in the pen. They had been handing out foil blankets but I thought I was OK with my extra top, although I took it off at 9.30, thinking we would be heading off promptly. When I crossed the line the race had been going for 12 minutes already so I was a bit colder by then. I had decided to be optimistic and aim for between 2 hours and 2.05, similar to my time at Brighton last year, so I needed to keep between 9 and 9.30 min miles. The first few miles wove through the town, around fairly big roads with lots of crowd support. I thought it would thin out but it was very busy until around the 4 mile mark. For a lot of it we were running on one side of the road, with only cones separating us from the traffic on the other side, and at one point a guy jostled me with his elbow and nearly pushed me out into the road. I could manage the rather British response of muttering “excuse me” under my breath. I was already getting warm and so I rolled up my long sleeves and took off my headband and I did wonder if I had overdressed with the two layers- time would tell. Miles 4-6 saw us running out of Cambridge and into the countryside toward Grantchester. There were some very empty parts, but then as soon as you got into a village there would be a big crowd of people cheering, with people playing music. The business of miles 2 and 3 had slowed me a little, but I picked up the pace once it thinned out a bit, and the various music stations lifted the spirits too. Miles 7-9 saw us running back towards Cambridge. The route was fairly flat with a few gentle ups and downs but nothing taxing, just enough to get a bit of variation. At around mile 7 (over half way!) I bumped into Paula from my running club, although we only briefly ran together as she had a bit of a stomach ache from a gel. Of course there was the obligatory steel pan band, playing Octopus Garden which then got stuck in my head for the rest of the run (there are worse things to hum). At times we were quite exposed to the winds, and there was still snow on the ground in places- my worries about being too hot didn’t come true and I was fine with just me sleeves rolled up. 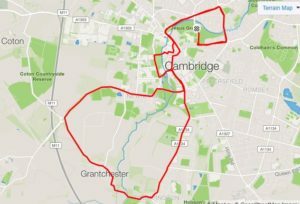 The final few miles were back in Cambridge, some of the beginning was run in reverse, but there were a few bridges to go up and down. You always hear someone saying “only a parkrun to go” now, which does make me smile, and I started to visualise our parkrun routes although I am not sure if that makes it feel shorter or longer. At one point we ran through some meadows with wonderful views of a big building (either a college or a church). By this time my quads were really stiffening up and I was worried I would get cramp. I passed the final water station (close to 11 miles I think) and had a couple of sips of water, and then got a bit of a stitch. I spent the next mile feeling rather grumpy- the race handed out water bottles with the silly sports caps, and the little plastic wires from around the tops were all over the floor. There were big recycling bins and runners were trying to aim them into the bins, but they were also being filled with gel wrappers so the waste is probably contaminated anyway. Had there been cups I could have chosen a cup with hardly any in it, but instead of that the rest of the water in my bottle went to waste. I did consider carrying it, but it was so cold that it made my hand ache. Anyway, rant over. The crowds in the centre were big and so I occupied myself crowd-watching. I saw my favourite sign; “Pain is just a French word for bread” which made me smile and helped push me on to the end. I knew that I wasn’t close enough to 2 hours, but that if I kept pushing I could get under 2.05, so I tried to use my arms as much as possible. As I came up to the final corner, lots of people (walking past wearing their medals) were saying “just around the corner and the finish line will be in sight” but in fact it wasn’t! The finish straight felt so long, and it took a while to even reach the 13 mile marker. I crossed in 2.04.40, and pretty much as I crossed the line I got a text message confirming it. Then you had to walk for a bit down the finish funnel, through another funnel and finally to collect a bottle of water, a goodie bag, medal, foil blanket and can of (alcohol free) beer. They were handing out cups of beer too but I didn’t fancy any- I was ready for breakfast! There was a banana in the goodie bag so I ate that while we were walking- I always love a banana once I have finished a race. The field was a total quagmire of mud- my legs were a bit jelly like at that point and it was hard to walk across the field to the hard path- I think all of the snow had melted overnight and so the ground was totally sodden. Andy met me on the path and we walked into the centre to Bill’s as we had booked a table. 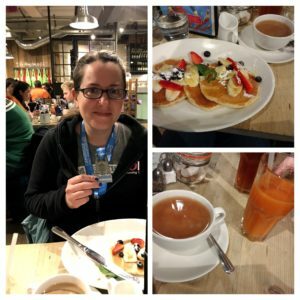 I changed clothes and then enjoyed pancakes and tea, we shared a carrot and ginger juice, and Andy even gave me some of his sweet potato fries- they make a good addition to the pancakes. 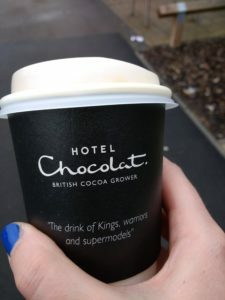 We had a walk around Cambridge after, and I was excited to find that the Cambridge Hotel Chocolat has a cafe (their hot chocolate is the best). This was an Easter special and even came with a little chocolate bunny- the lady in the shop handed it to me as I don’t have the cream on top so there’s no-where for it to balance. Then it was time to walk back to the car, drive home and have a shower. I thought all of the walking was helpful, but by Sunday evening my legs were feeling pretty sore. I made sure to do plenty of foam rolling, but they only started to feel better after yoga on Wednesday. 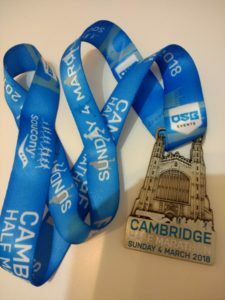 Overall I enjoyed the Cambridge half marathon. The route was varied enough, well supported, and it generally seemed well organised. I didn’t use the bag drop but I didn’t see big queues so hopefully they have sorted that this year. It was nice to be able to get home fairly quickly (it’s about an hour drive), and of course having the hotel was a bonus. I’m not sure I would do it again, but it’s probably got pb potential as it is fairly flat, you’d just need to try to avoid the crowded parts. They did have pacer runners but I didn’t see any in my starting pen (and I am sure they ran to chip time as a 2 hour pacer finished a little behind me). When I finished I did think that I would like to run Brighton again next year- there is something about running by the sea that I do really enjoy. Do you like to run the same routes/races again, or do you prefer to run new ones? 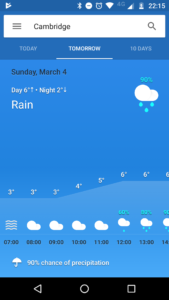 Did you have much disruption from the snow this weekend? What is your ideal post-race meal? What do you like to see in a goodie bag? Congrats on the half marathon time! Sounds like a good race. And nice medal and goodie bag! I like a bottle of water and maybe a snack or bag of popcorn. Maybe some sweets as a treat. I ran in the snow in Birmingham and it was tough going but fun. Not that cold but just hard on the feet placement. I went to the Showcase cinema in Southampton and they have similar reclining chairs (with the two buttons) but no trays. I think the tray thing kind of encourages the whole over snacking thing in cinemas… It would annoy me if people were having full on dinners or elaborate snacks next to me because of the food and smell. Yeah, the trays were basically the size of a normal tray too so you could have had piles of food. Well done – a cracking time too. Well done! So glad the race went ahead after all the snow. 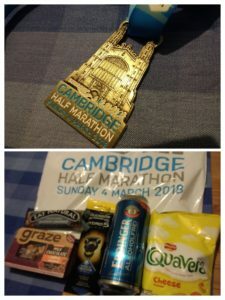 In a goodie bag I always like plenty of water, a savoury snack and maybe some sweets, especially if it’s been a longer race. As a meal I like a burger and a beer. If it’s been hot then I crave salty foods. I was able to get a decent amount of running done in the snow. It was great fun and not that cold, although lots of people still thought I was mad! Glad you got some of that awesome Hotel Chocolat easter hot chocolate. I LOVE their cafes! Yes, they do the best hot chocolate! The one in St Albans now does the ice cream so I am hoping that soon it will expand and do the drinks too. 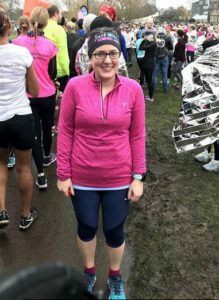 Sorry it’s taken me so long to comment, I’m a little behind with my favourite running blogs. Congratulations on completing Cambridge in such an amazing time Maria. The goody bag looks pretty good and I love the medal. My friend said she had a mens razor in her goody bag. I suspect there weren’t any female razors. Those pancakes look really tasty. It’s a shame you didn’t make it, but there is always another race.